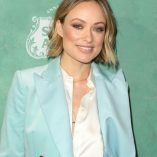 Images of Olivia Wilde at the 11th Women In Film Celebration. Olivia attends the 2018 Female Oscar Nominees celebration presented by Women In Film. She wears a powder blue suit and a long sleeve white satin blouse at the event on the 2nd March 2018.